Let's give this Baby a spin then! Lifting restriction number...wait, wrong franchise...Again. Hello all. The name's Beat. Sailov V invited me here and, well I've sseen Sailor Moon since I was 10 in Latin Dub. It wasn't that bad, they didn't censor Haruka and Michiru's Romance, though they did change the dreaded "Rini" though I like it. 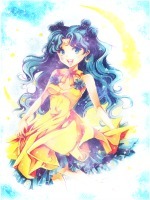 I like all the Senshi, I think the all have potential and their own flaws to make them human. I love to rp, write and help with fics. Also due to a challenge put to me by Sailor V, I'm gonna make a crossover of SM with DBZ and believe me, you need to know nothing about Dbz to enjoy it. I will post it soon. Anyhow, looking forward to meet you, read you later. Hi Beat!!! Glad that you join us!!! hey beat! glad to have you!! Subject: Re: Let's give this Baby a spin then! Lifting restriction number...wait, wrong franchise...Again.